Spot Zone, spot them all! You're traveling through another dimension, a dimension not only of sight and sound but of mind. A journey into a wondrous land whose boundaries are that of imagination. That's the signpost up ahead - your next stop, the Spot Zone! In Spot Zone, you have to find all the 5 differences between two photos as soon as possible. In each level, differences are randomly generated, so each play will be unique! Discover a lot of wonderful photos from all over the world in this challenging & relaxing new game! If your have a phone screen size superior to QVGA(240x320), like HTC Diamond, or HTC touch Pro, try the Spot Zone HD version. In Spot Zone HD, pictures of each level have been specifically designed for high-definition mobile screens. 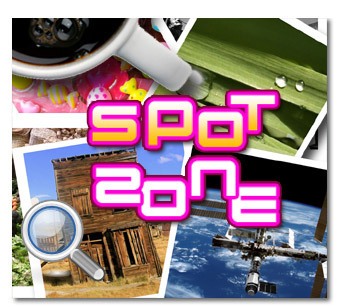 You can buy Spot Zone and later download HD pack	for free, or directly download Spot Zone HD, which comes with normal and HD pack. You can easily write your own expansion pack for Spot Zone! If the pack is accepted, each contributor will receive a game from Manbolo. If you're interested in writing an expansion pack, mail-us to contact@manbolo.com, or use this form.